In everyday usage, the word "density" usually refers to the state of being dense, as in "the traffic is dense," or "that person is too dense to understand you." The density (D) definition in science is much more specific. It's the amount of mass (m) that occupies a specific volume (v). Mathematically, D = m/v. 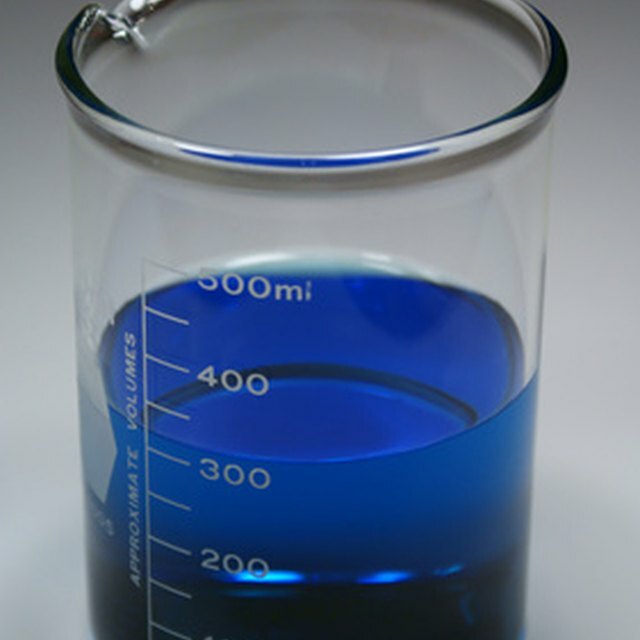 Density applies to matter in the solid, liquid and gaseous state, and – no surprise here – solids are more dense than liquids (usually), and liquids are more dense than gases. On a microscopic level, density is a measure of how closely packed the atoms that make up a particular substance are. If two objects occupy the same volume, the denser one is heavier because more atoms are packed together in the same space. Density is affected by temperature, and it's also affected by ambient pressure, although these dependencies are most pronounced in the gaseous state. Density differences drive the world; life wouldn't be the same without them. Water has a density of 1 kilogram per cubic meter. If that sounds like a coincidence, it isn't. The metric units of mass are based on the density of water. Most oils are less dense than water, and that's why they float. Whenever you mix two liquids or gases, the denser one falls to the bottom of the container, as long as it doesn't dissolve and form a solution. The reason for this is simple. Gravity exerts a stronger force on a dense material. The fact that oil doesn't dissolve in water and that it floats makes cleanups possible after a large oil spill. Workers usually recover the oil by skimming it off the surface of the water. Blow up a balloon with air from your lungs, and the balloon will sit happily on a table or chair until someone throws it into the air. Even then, it may float on air currents for a while, but it will eventually fall to the ground. Fill it with the same volume of helium, though, and you have to tie a string on it to keep it from floating away. That's because, compared to the oxygen and nitrogen molecules in air, helium molecules are very light. In fact, helium is approximately 10 times less dense than air. The balloon would float away even faster if you filled it with hydrogen, which is more like 100 times less dense than air, but hydrogen gas is highly flammable. That's why they don't use it to fill balloons at carnivals. Add heat to air and the molecules fly around with more energy, making more space between them. In other words, the air becomes less dense, so it has a tendency to rise. However, the temperature in the troposphere gets colder with altitude, so there is more cold air at higher elevations, and it has a tendency to fall. The constant movement of cold air falling and warm air rising creates air currents and winds that drive weather on the planet. Temperature variations in the oceans also create density differences that drive currents, but salinity variations are just as important. Seawater isn't uniformly saline, and the more salt it contains, the denser it is. Temperature and salinity variations create density differences that drive local eddy currents as well as deep underwater rivers that create habitats for marine creatures and affect the world's climate. Lab researchers depend on density differences to separate substances in the liquid or solid state. They do this with a centrifuge, which is a device that spins a mixture so quickly that it creates a force that is several times bigger than the force of gravity. In the centrifuge, the densest components of a mixture experience the largest force and migrate to the outside of the vessel, from where they can be retrieved. Density can also be used to identify materials made from unknown compounds. The procedure is to weigh the materials and measure the volume they occupy, using water displacement or some other method. You then find the density of the material, using the equation D = m/v, and compare it to the known densities of common compounds listed in reference tables. Chris Deziel holds a Bachelor's degree in physics and a Master's degree in Humanities, He has taught science, math and English at the university level, both in his native Canada and in Japan. He began writing online in 2010 with the goal of exploring scientific, cultural and practical topics, and at last count had reached over a hundred million readers through various sites. What Is the Density of CO2? Deziel, Chris. "Examples of How Density Works." Sciencing, https://sciencing.com/examples-density-works-23804.html. 15 October 2018. Does Cold Air Cause Latex Helium-Filled Balloons to Deflate?